The Los Angeles federal courthouse located at 312 North Spring Street was recognized in the 2006 National Register of Historic Places. Six years later in 2012, the United States Department of Interior and the National Park Service designated the courthouse as a national landmark for its importance in American school desegregation efforts and the civil rights history of Mexican American people in the Southwest due to the 1946 decision in the class-action lawsuit Mendez et al. v. Westminster School District, the first successful constitutional challenge to segregation and the forerunner of Brown v. Board of Education. Throughout the decades, the courthouse has been the site of numerous trials and proceedings involving important issues and well-known celebrities and has reflected and played a significant role in the ever-changing Los Angeles culture and landscape. During the 1930s, industrialization influenced design while emphasizing practicality and functionality. Although simplicity seemed to be the period’s goal, the Art Deco movement, characterized by its decorative and highly stylized features, emerged as a prevalent style in both architecture and design by the end of the decade. The 1930s also saw the development of a new federal courthouse in Los Angeles. Gilbert Stanley Underwood, an acclaimed architect who had already designed and completed several important federal buildings, including the U.S. Mint in San Francisco, was chosen to design the third federal building in Los Angeles. In 1937, the existing federal building was razed for a larger one that would house a United States courthouse, post office, and various federal agencies. Originally designed to be fifteen stories tall with a price tag of $7 million, two more stories were added to the building between 1939 and 1940. 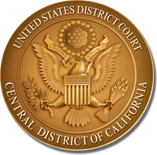 At the time of the groundbreaking for the new building, California had two federal judicial districts: the Northern District based in San Francisco and the Southern District based in Los Angeles. The Southern District was further subdivided into three divisions – northern, central, and southern. Initially in 1888, the Southern District had only one judge who held court in rooms on the upper floor of the Farmers and Merchants Bank on 230 Main Street. Four years later, the judges sat at the U.S. Government Building on Main and Winston. The court then moved again in 1910, this time to the federal building located on Temple and Spring Street, which was razed in 1937 to make room for a larger federal building on the same site where the courthouse sits today. A year later, in 1938, the Southern District grew to hold six authorized judgeships. The post office opened inside the federal building on January 23, 1939. It featured massive bronze double doors leading to the lobby that displayed an Edward Biberman California history mural. That day, people were seen rushing to the stamp and general deliveries window after the doors opened, and Nellie Wood was the first woman to buy stamps in the new post office.